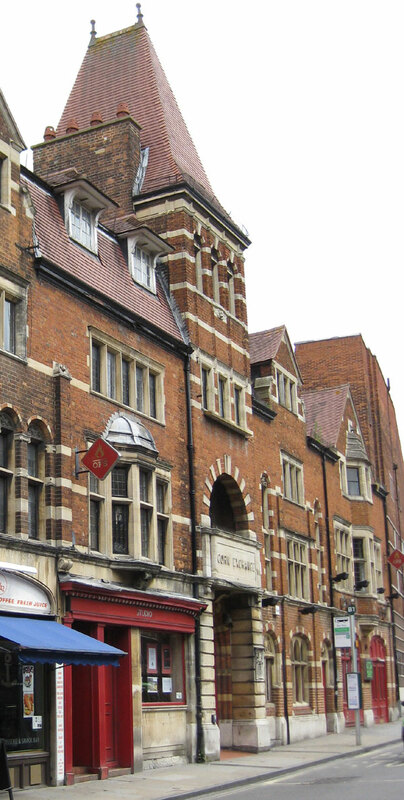 The Gothic fire station and corn exchange were designed by H. W. Moore and built in George Street by Thomas Axtell in 1894–6, replacing a range of old houses, some of which probably dated from the seventeenth century. 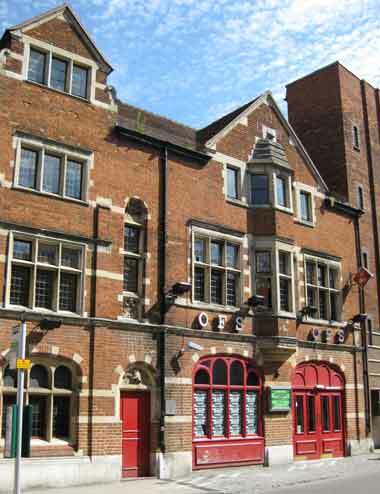 A city volunteer fire brigade was founded in 1870, and a headquarters and engine house were built for them in New Inn Hall Street in 1873/4. This was replaced by the fire station (left) which was opened at the north-west end of George Street in 1896. The George Street fire station remained in operation until 1971, when it moved to Rewley Road. The former Oxford Playhouse Company, Meadow Players, then leased the building as offices, and wardrobe and property storage, and for scenery painting. 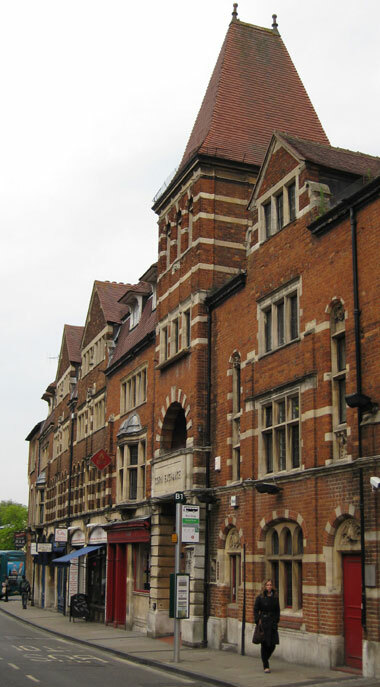 The Meadow Players company closed in 1973, and the Oxford Area Arts Council was then formed to take over the building and to operate it as a centre for performance and participation arts, dance, drama and musical performances, exhibitions, lectures, and recitals. 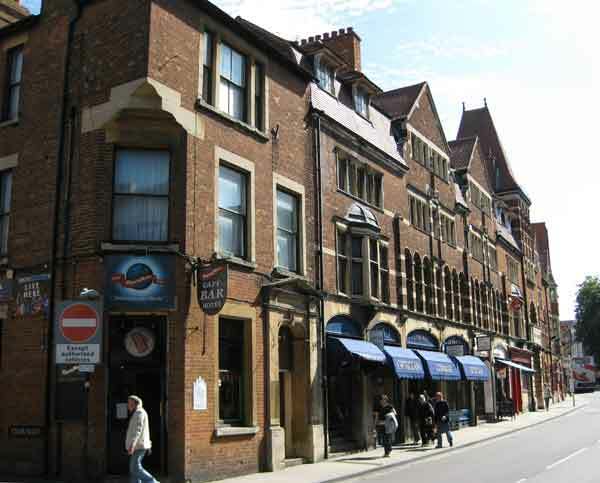 Until 1855, samples of corn were displayed at Carfax or in the Roebuck Hotel in Cornmarket Street. In January that year the covered market began to be used, but this proved too crowded, and in 1863 a proper Corn Exchange Building was opened in the town-hall yard. This first corn exchange was demolished with the rest of the old town hall in 1893, but there was an outcry the following winter because the corn dealers and others had to transact their business in the open streets without any kind of cover. So a new exchange, designed by H. W. Moore (right), was built in 1894/5 on the north side of George Street, attached to the west side of the fire station. Jackson's Oxford Journal of 12 October 1895 reported that the building was expected to be open within a few weeks, and describes it in detail. When Oxford cattle market moved from Gloucester Green to Oxpens in 1932, the corn merchants acquired stands in the settling-room there. The erection of the new buildings, situated between George-street and Gloucester Green, has been pushed forward with commendable vigour, a large staff of men having been employed night and day in order to get the work finished within the expected time. The buildings are expected to be finished in a few weeks time. The architect’s design includes premises for the Corn Exchange, Fire Brigade Station, a range of shops in George-street, and other business premises. The Corn Exchange abuts on the Gloucester Green side of the site, giving greater quiet; the north windows and approaches are suited to the varying levels of the roadways. The main entrance is from George-street, and forms an important feature in the elevation, the approach being up an easy flight of steps into the vestibule, and thence into the Exchange. Other entrances are arranged from Gloucester Green. A gallery runs along one side of the building, with staircases at either end. There is also lavatory accommodation, offices, heating vaults, and stove cellars. The Fire Brigade Station is placed on the east side of the site, occupying a strip running the full depth of George-street to Gloucester Green, with suitable approaches from both. The accommodation provides a commodious engine room, drill shed, watch room, and workshop, with a tower about 60 feet high for hanging hose pipes. On the upper floors are arranged the club rooms, committee rooms, and stores. A private dwelling house is likewise provided for the resident fireman, The remaining portion of the George-street frontage is taken up by a range of four shops, with suitable residences, and that of the Gloucester Green frontage to a block of buildings, suitable for a private residence or business purposes. 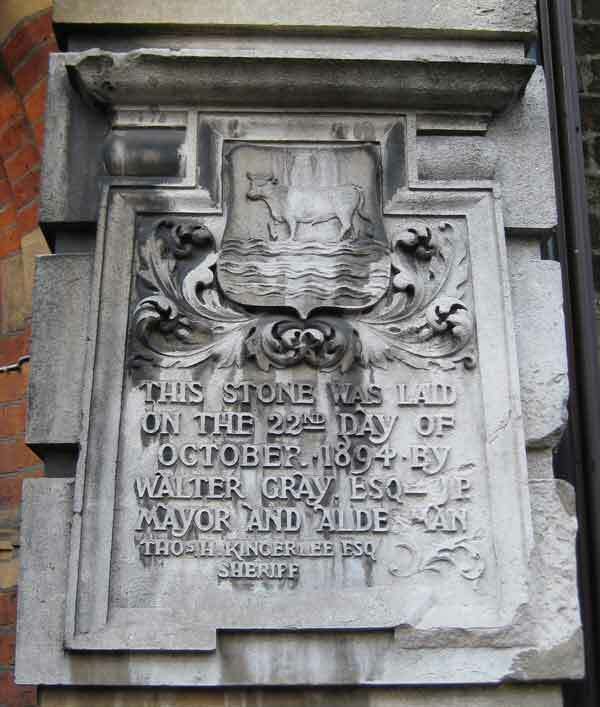 The elevation[s] to George-street and Gloucester Green are executed with red brick facing and free stone dressings. 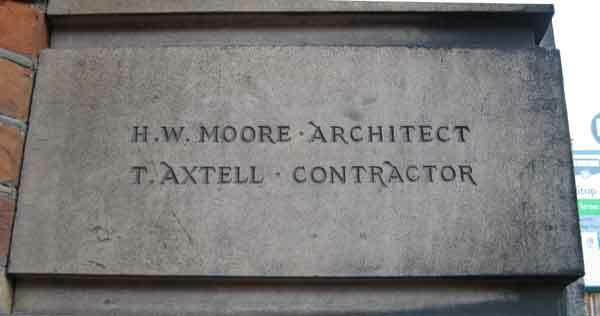 The architect is Mr. H. W. Moore, and the contractor Mr. Thomas Axtell, both local men. Pickford’s later expanded into the old Corn Exchange itself. The present Nos. 46 and 48 to the west were also part of the Corn Exchange block, and some renumbering has taken place as shops expanded to a double frontage. Wolsey Hall Diploma College began life at No. 46.
and it was his firm renovated the Old Fire Station in 2011.